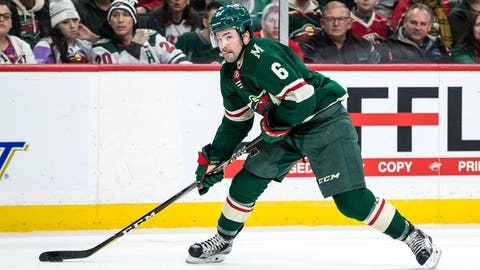 Defenseman Ryan Murphy is returning for a second season with the Minnesota Wild. Murphy signed a one-year, two-way contract Monday worth $650,000 if he plays in the NHL, and $275,000 if he plays for Minnesota’s AHL affiliate. The 25-year-old had two goals and three assists in 21 regular-season games for the Wild last year. Murphy made his playoff debut in Game 5 of the Wild’s first-round playoff series with the Winnipeg Jets. Originally selected by the Carolina Hurricanes with the 12th pick in the 2011 NHL draft, Murphy made 151 appearances for Hurricanes in five seasons before signing with the Wild last year. Minnesota landed defenseman Jonas Brodin with the 10th pick in that same draft.